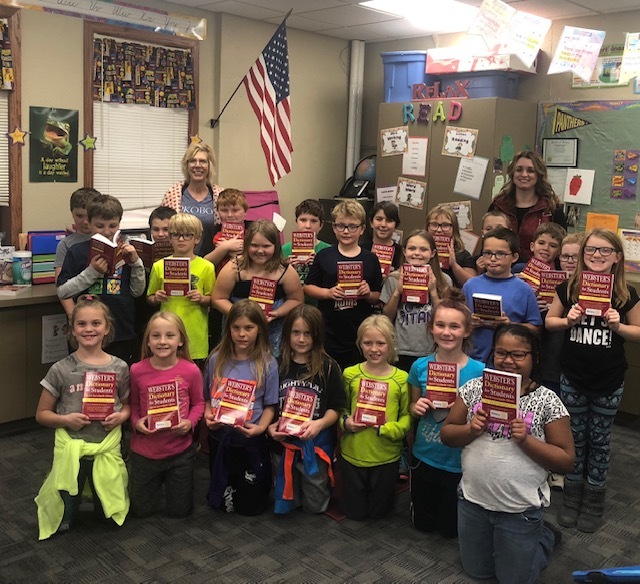 The Iowa Great Lakes Rotary Club has been busy this past week delivering dictionaries to all Dickinson County Third Graders. The Dictionary Project is a 501(c) (3) nonprofit organization that works with local sponsors and volunteers. The Iowa Great Lakes Rotary Club has been handing out dictionaries for more than 10 years. Helping third grade children in our community improve their communication skills and literacy makes this a very rewarding project! Shown above are the Terril third graders along with IGL Rotarians Janie Eick and Peggy Gustafson.